The crew of China's Shenzhou 9 mission waves to a camera aboard the Tiangong 1 space module after successfully docking their capsule at the test module on June 18, 2012, in this still from a state-run TV broadcast on CNTV The crew is (from left) Liu Wang, Liu Yang (China's first female astronaut), and mission commander Jing Haipeng. Chinese astronauts docked two spaceships in orbit for the first time Monday (June 18), marking a vital milestone in the country's quest to build a manned space station in Earth orbit. The three-person crew of the Shenzhou 9 spacecraft, which includes the China's first female astronaut, arrived at the country's Tiangong 1 ("Heavenly Palace") test module in orbit and joined the two craft to complete the successful docking. The maneuver is the first manned docking for China, making it the third nation, after the United States and Russia, to achieve such a feat. "We are one step closer to our destination of constructing a future space station," an official with China's space program said during a broadcast on the state-run CNTV news network. "This is the first successful crew transportation mission for China." This artist's illustration from a China space agency video shows the Tiangong 1 space laboratory, a prototype module for the country's planned space station. Shenzhou 9 and the Tiangong 1 space module docked in an automatic mode during Monday's successful link-up, with the Chinese astronauts (called taikonauts) to stay in orbit for about 13 days. Later this week, the Shenzhou 9 crew will undock their spacecraft from Tiangong 1 and then re-dock in a manual mode in another test, Chinese space officials have said. The mission is notable not just for the docking, but for the fact that this crew includes China's first female taikonaut. People's Liberation Army pilot Liu Yang is flying with repeat astronaut Jing Haipeng and rookie Liu Wang. China's Shenzhou 9 mission commander Jing Haipeng waves to a camera after boarding the Tiangong 1 space module following a successful June 18, 2012 docking, China's first manned orbital rendezvous, in this view from state-run TV news. After Monday's successful docking, Jing entered the Tiangong 1 module first and waved to a TV camera to flight controllers on Earth. 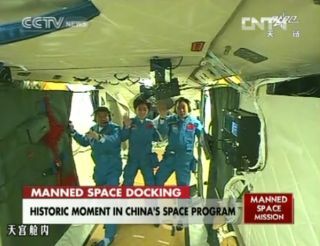 Liu Wang followed Jing inside the module while Liu Yang remained inside the Shenzhou 9 capsule performing final checks. Later, Liu Yang entered Tiangong 1 and applause was heard from China's mission control room at the Beijing Aerospace Control Center as all three Shenzhou 9 astronauts boarded the module. "I feel honored to fly into space on behalf of hundreds of millions of Chinese females," Liu said before the launch, according to Chinese state news agency Xinhua. Now that they have arrived at their new orbital home, the taikonauts will soon start settling in and exploring the Tiangong 1 module. In addition to necessary equipment, a collection of surprise trinkets have been planted around the lab for the astronauts to find, both for fun and to test the crew's puzzle-solving abilities in orbit. "Discovering unexpected items by themselves could add more fun to living in space," said Chen Shanguang, general director of the astronaut system department, Xinhua reported. Tiangong 1 launched in September 2011, with another unmanned vehicle, Shenzhou 8, lifting off in November of that year to link up with it, marking China's first docking. This crewed docking a new step forward for China's plans to built a large manned space station by the year 2020. Eventually, China aims to land people on the moon, officials with the country's space program have said.